Who Won the Agecroft Sweet Bag Thread Kit? Well, as promised, today I’m announcing the winner of the Agecroft Sweet Bag silk thread kit give-away! And you know, I thought I’d wax loquacious for a bit, and ramble on about the how fun the give-away was, how much I enjoyed reading your comments (yes, I read all 740+ comments! ), and how much I appreciate the enthusiasm and interest of all of you – how you inspire me, how great I think it is to be able to “connect” with like-minded embroiderers, and on and on and on! Yes, I was going to ramble on. But really, I know you just want the punch line! Who WON?! Congratulations, Blanca! Please contact me with your mailing address, and I will get this package on its way to you. As usual, I wish I could send you each the collection. It’s always hard to just pick one winner, but on the bright side, we’ll do this type of thing again, don’t worry. If you’re looking for the thread kit, you can order it through your local needlework shop or online. Plenty of interesting stuff coming up this week on Needle ‘n Thread – some project updates, some more kit talk, a book review, a pattern, some stitching tips and whatnot. I’m looking forward to the week, and I hope you are, too! Have a terrific Monday! December 18, 2017 A Stitcher’s Christmas #7: Needlework Books Galore! 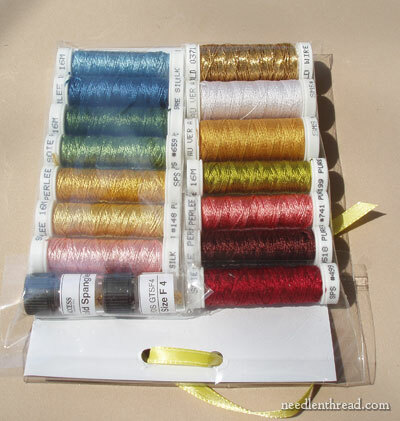 April 19, 2011 Easter Give-Away – Silk & Gold Thread Kit! Congratulations Blanca!!! Thanks again Mary!!!!!! Mi enhorabuena a Blanca, seguro que utilizará estos hilos en un maravilloso proyecto. Looking forward to a week of lovely weather in my hometown and your posts. I hope your Easter was blessed. Apart from your fine teaching and your sharing of your skills and goodies, I derive great pleasure from seeing how many people are enthusiastic about needle arts–people from faraway places and of many languages! There are organizations that keep the art alive, but it’s wonderful to see everyday people like me enjoying your work and “chats,” and your abundant library where one can click and learn. May the Lord continue to shed His Grace upon you as you so joyfully serve Him through the gifts with which He has blessed you. Congratulations Blanca! Have fun with your new threads & spangles. Sure hope you will share some photos of your work in progress. Maybe we can persuade Mary to post them? Eye candy is fat free! Good on you both! Mary for your graciousness, generousity and smiles. Blancal for your beaut comment and luck of the draw. What fun. Congrats Bianca! <3 It's a lovely kit indeed! Next Next post: Miniature Stitching: Another Person!